New Directions Publishing Corporation, 9780811214933, 238pp. 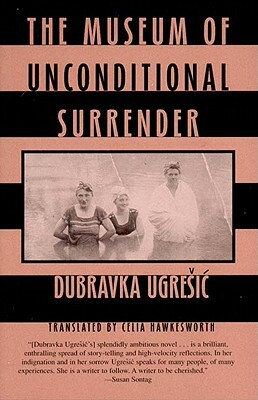 The Museum of Unconditional Surrender--by the renowned Yugoslavian writer Dubravka Ugresic--begins in the Berlin Zoo, with the contents of Roland the Walrus's stomach displayed beside his pool (Roland died in August, 1961). These objects--a cigarette lighter, lollipop sticks, a beer-bottle opener, etc.--like the fictional pieces of the novel itself, are seemingly random at first, but eventually coalesce, meaningfully and poetically. Written in a variety of literary forms, The Museum of Unconditional Surrender captures the shattered world of a life in exile. Some chapters re-create the daily journal of the narrator's lonely and alienated mother, who shops at the improvised flea-markets in town and longs for her children; another is a dream-like narrative in which a circle of women friends are visited by an angel. There are reflections and accounts of the Holocaust and the Yugoslav Civil War; portraits of European artists; a recipe for Caraway Soup; a moving story of a romantic encounter the narrator has in Lisbon; descriptions of family photographs; memories of the small town in which Ugresic was raised. Addressing the themes of art and history, aging and loss, The Museum is a haunting and an extremely original novel. In the words of the Times Literary Supplement, "it is vivid in its denunciation of destructive forces and in its evocation of what is at stake.